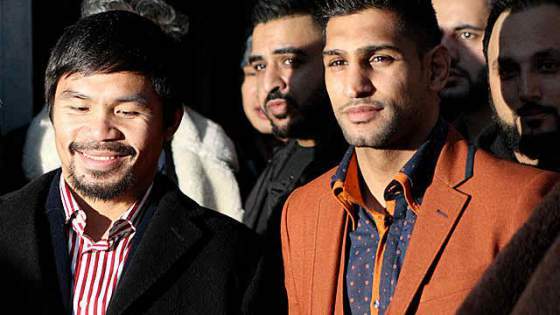 Arum: Manny Pacquiao can fight Amir Khan in 2016 - Balita Boss! The British former two time world champion Amir Khan could fight former sparring partner Manny Pacquiao next year, says promoter Bob Arum. "This kid Amir Khan keeps shooting his mouth off about Manny Pacquiao. I can arrange for Khan to fight Pacquiao," Arum, Pacquiao's promoter, told The Telegraph. "Amir Khan has been begging Mayweather for a fight and now he can get a major fight. I'm not a hard guy to deal with. I'm not going to mess them around," said Arum. The British welterweight had hoped to fight Floyd Mayweather, but the pound-for-pound king opted for Andre Berto instead, a decision Arum describes as a 'farce'. Khan has since flaunted the possibility of a bout with Pacquiao, who lost to Mayweather earlier this year in the richest fight in boxing history. Continue reading on Mirror.co.uk. "Pacquiao is not ducking Khan. Pacquiao will fight him. I don't know if Khan will fight Pacquiao, but it's available," he told The Telegraph. Arum was enthusiastic about the prospect of Pacquiao meeting Khan and spoke positively regarding the former's chances of emerging victorious, he stressed that any fight will not take place in 2015 with 'Pacman' forced to undergo surgery on the right shoulder injury that sparked controversy following his defeat to Mayweather. Continue reading on IBTimes.co.uk.